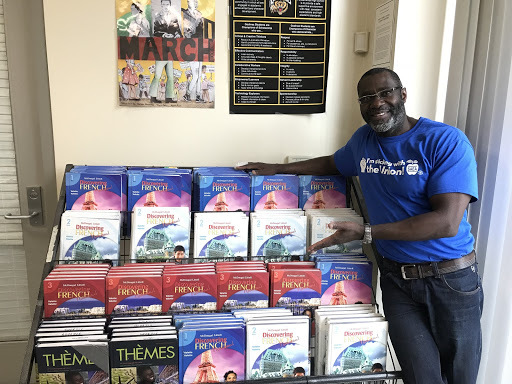 French teacher Eric Pierre standing besides his bookshelf of French textbooks. From living in the north of the Atlantic coast of South America in French Guiana to living in Paris, France, French teacher Eric Pierre opens up about his upbringing and struggles growing up. Pierre is the only French teacher at Godinez. He teaches French I, II, III, and AP French. He has only been apart of the Grizzly family for two years but for those who have already taken French, they know that he is one of the most generous teachers on campus. “He is so open and understanding on when we do not understand something so quickly and he takes his time to help us.” said freshman, Alexis Gutierrez from Mr. Pierre’s French I class. “I like Mr. Pierre’s class, he helps us learn the material, he explains it very well and understanding about our mistakes. I want to become fluent in French and with the help of Pierre I know I can.” said freshman, Jean Rojas from Mr. Pierre’s French I class. Pierre was born in French Guiana but moved to Brazil at the age of 3. “My parents moved to Brazil when I was 3, my dad was a pastor in missionaries and my mom was a school teacher. They have been moving around when I was growing up as a kid.” After living in Brazil, Pierre ended up in Guadeloupe, a French Caribbean island until he was 8. He relocated again to Martinique for another two years and finally settled in Montréal, Canada until he was 17-years old. At the age of 14, when Pierre was in middle school, his mom and dad both passed away in the span of six months. “My mom had a tumor. She ended up having an aneurysm and then my dad, he ended up letting himself go because of his devastation of the loss of his wife, he didn’t eat or drink for days.” His siblings ended up raising him until he finished high school. After high school, Pierre moved to France where he did his mandatory military service for two years. “I loved it because it taught me a lot of things such as principles and discipline,” said Pierre. After military service, Pierre ended up attending Université Jussieu where he studied accounting and became an accountant for 15 years in France. In 2007, Pierre made the decision to move to the states. He always knew that he wanted to move to California because of the beautiful weather. Pierre did not have teaching as his first choice, he wanted to go to medical school but ended letting that go because it would “take too long.” He went to nursing school for two years but he did not seem to enjoy it and found it stressful. Pierre decided to go into teaching instead. He always wanted to work with people. He has been teaching French for seven years. He taught at Lakewood High School from 2012-2017 and is now at Godinez Fundamental. In 2014, Pierre was diagnosed with colon cancer. He got treated for it and recently ended up beating cancer last summer. Now currently at peace, Pierre enjoys reading, going out for long walks on the beach, riding the bicycle with his kids, and going to the gym. Pierre highly encourages people to look into and possibly sign up for the trip to France. He wants to give students the opportunity to travel abroad and experience how different the French culture is to the American culture. For those who are seriously interested in practicing French or just traveling, they should look into it. The trip will a week with them staying in Paris for three days, Provence for two days and Côte d’Azur for two days as well. People are still able to sign up until December 10. In my opinion, Mr.Pierre is a very eminent person, he is supportive and someone to look up to. Besides this, Mr.Pierre is also an avid, aspirant French teacher, who within every day that passes by, he encourages others to do their best as well as not giving up in the learning of French. Even though some days he may feel down or tired with not wanting to do much, he still gives his all to not let anyone down and do largen the learning of others. I am thankful Mr.Pierre is one of my teachers because he is very comprehensible and still manage to do his best even at his worst times. He is an inspirational teacher, in my opinion, because he always put a smile on peoples faces one way or another.